Fried plantains, fiesta beans and rice, and pico de gallo. This meal is a medley of Latin-inspired flavors, and these three items work SO well together. 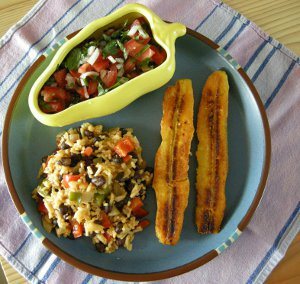 The slightly sour bite of the lime in the pico de gallo is balanced by the warm, sweet plantains…and the beans and rice complement both of them. I found myself trying to get a bit of all three on the fork at the same time…try it!